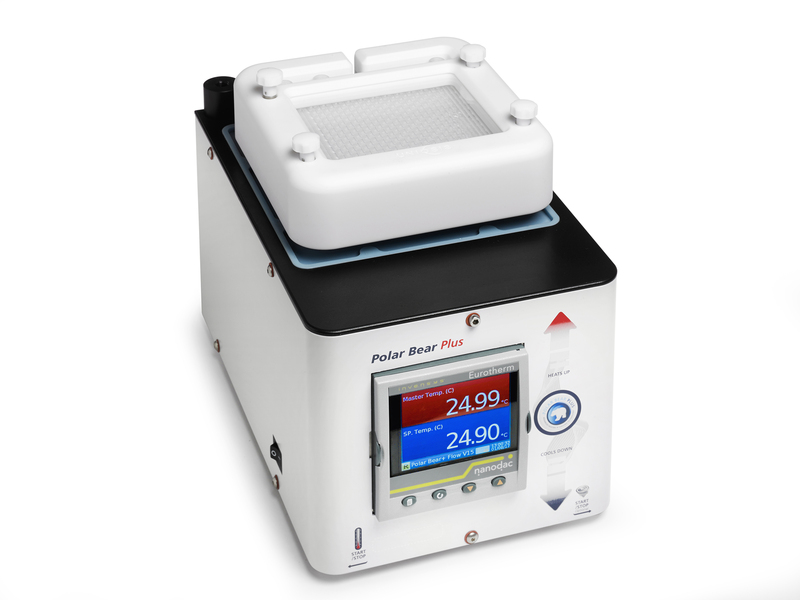 Uniqsis has introduced the Polar Bear Plus GSM, a versatile heating and cooling reactor module for flow chemistry applications using glass static mixers/reactor chips (GSMs). To achieve high reproducibility and facilitate scale-up the control of mixing and temperature is essential, particularly for highly exothermic or fast, mixing-dependent reactions. Uniqsis glass static mixer/reactor chips produce an efficient, turbulent mixed reagent stream that is not diffusion dependent. Compatible with all Uniqsis GSMs from 250µl to 20ml total channel volume the unit delivers precise flow reactor temperature control from –30°C up to 150°C. The Polar Bear Plus GSM will accommodate all sizes of GSM from a single large chip, or using a conductive insert, up to two of the smaller GSMs. Customised holders are also available on request. The new reactor is easy to use and is completely self-contained, requiring only an electricity supply for operation - no cardice, refrigerants or messy heat transfer fluids. An insulated PTFE cover with view window allows GSMs be conveniently removed and refitted without the need to disconnect the fluidic connections. In addition to the manual control interface, the Polar Bear Plus GSM can be controlled remotely using the FlowSyn flow chemistry system or Binary Pump Module. However, for maximum flexibility and, in particular for flow chemists who wish to build their own bespoke or a more complex component-based flow chemistry system, the new reactor is fully compatible with Uniqsis FlowControl II system control software.